Wiring diagram (2H oop + serial): is this really serial humbuckers? Some time ago I found this diagram online. What I'd like to know is: Is that really serial wiring of humbuckers? Or, would there be a more accurate way to describe that? The thing is: When I wire that version of serial, it cuts off one pot. It's clearly different than the first one. Plus, when I tried that one with oop... I didn't like the sound as well as the first one. That truly serial wiring sounded a bit loud. I really liked the sound of he first one (oop + "serial"). I've always been unable to grasp electrical wiring. I was wondering if someone could explain what that first ("Albert king tone") diagram is doing, in what way is it serial? (Or in what way isn't it?). I'm implementing it in my guitar and would like to describe it correctly. If that's not really serial, I'd like to avoid referring to it as such. Is there a better term to describe that? I don't recall where I found that. I "tineye" reversed searched for it. But, nothing stood out as a source. [If this should have been posted to the sticky "Wiring Library," I won't be offended if a mod moves this. I wasn't sure.]. That is in fact Serial, OOP humbuckers. In the first diagram you can see that the normal position (contacts to the right on push pull), or push pull down, the switch maintains normal LP, Parallel, In-Phase humbuckers. The up position simultaneously places the pickups in series and OOP. The diagonal blue jumper reverses the phase of the neck Pickup, while the purple wire placed the output of the bridge pickup at the input of the neck pickup, placing them in series. I believe the bridge pickup volume will then be the master. Thank you. Now I won't worry that I'm advancing an incorrect description. I'm getting ready to drill holes, and write a how-to (to add this wiring to my Special-II's dual-concentric pots mod, giving me 2 vol, 2 tone. [EDIT: that "Al King tone" mod is posted.]). I wasn't sure of the 1st diagram's pedigree. I was feeling uneasy about not knowing for sure what that wiring is. (It definitely sounds good though). The 2nd diagram was like that. The 1st seemed to be affected by both neck & bridge controls. But, I didn't turn them much. Just enough to hear one wasn't dead. All 3 pickup-toggle positions worked. That was different to. (The 2nd went mute in at least one position, maybe two. I forget.). I wired both using micro-clip jumpers. I went back and forth 3-4 times. I could have connected the wrong lugs But, not that many times. Right now my (Special-II) pickups are taken apart. I'm converting them from the 1-conductor (+ ground) to 4-cond (+ ground). The wire should arrive tomorrow. Then I can try diagram #1 again and confirm how the knobs work. If it's different than I thought I experienced last time, I'll reply with that correction. ...while the purple wire placed the output of the bridge pickup at the input of the neck pickup, placing them in series. The OOP part is clear. (I could swap the neck's green and black wires.). But, when I started considering the serial part of "Al King," wouldn't connecting the neck's black wire to the bridge's essentially be the same thing as the 3-way selector being in the middle (combining the two pickups' hot wires)? Does that mean the Special-II's factory wiring (with master volume & tone) is serial (unlike 4-pot guitars that are parallel by default)? This is the type of electrical stuff that is impenetrable to me. To me, the Special-II's master vol/tone wiring is simply the opposite of the 4-knob Les Pauls. The pickups go to the switch instead of the pots. 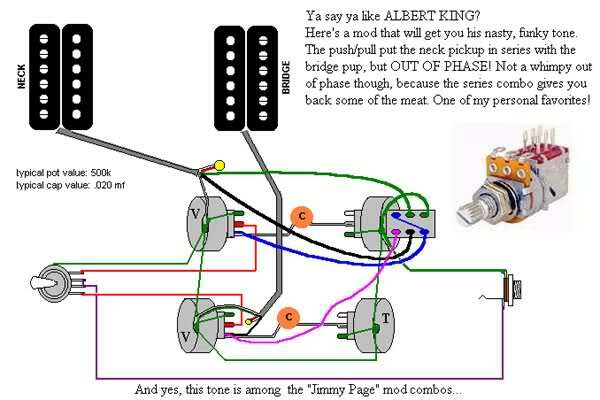 If the "Al King" diagram depicts serial wiring (by connecting the neck's hot wire to the bridge's hot), it seems like that's what's happening with the Special-II's master vol/tone wiring (with the 3-way selector in the middle). I appreciate any insight into this. The pickups are normally 1 hot wire, and a bare ground wire. I converted mine to 4-conductor. That's what the diagram depicts, not the original pickup wiring. The only difference is that the green wire is carried separately to the cavity. The original pickup wiring has it going to ground at the pickup. (The shield/ground carried the green wire too. Which makes for a hummy OOP.). 1.) A General PSA: Remember that implementing an OOP wiring mod with humbuckers and only one volume is going to be a fixed, and likely one dimensional, sort of tone. The classic Gibson, 2 HB/2 Volume Peter Green type of tone won’t be available to a large degree without the ability to vary the individual volume controls for each humbucker. You may be able to adjust the tone ever so slightly by changing pickup height, adjusting the screws, etc. but in general you’ll have something approximating the pinched, quacky tone of a 2 Volume guitar with both dials set evenly pretty much all the time with the OOP switch engaged. For all intents and purpose this is functionally the same setup. It does nothing to alter the parallel wiring of the pickups in the middle position. Series wiring changes the configuration such that one humbucker cascades into the other, i.e. wires the output of one pickup to the input of the other. These are two fundamentally different tones. It’s essentially the same configuration a Tele with a series mod. 1.) A General PSA: Remember that implementing an OOP wiring mod with humbuckers and only one volume is going to be a fixed, and likely one dimensional, sort of tone. The classic Gibson, 2 HB/2 Volume Peter Green type of tone won’t be available to a large degree without the ability to vary the individual volume controls for each humbucker. Thanks for your reply. I did convert my Special-II to dual-concentric (2-vol, 2-tone without new holes; how-to linked earlier in this thread). [And, converted my 1-conductor (plus ground) pickup leads to 4-conductor (how-to linked in my prior post).]. So, your caution doesn't apply to me. But, I'm glad you brought it up. I'll mention it in my how-to (and will link to this thread). I think I know what you're talking about. When I converted my original Special-II to dual-concentric, it seemed to open up the tone. In fact: I had a bad 3-way (pickup selector which cut out in the middle position, one pickup or the other; it was fiddly). It didn't stand out to me until I had separate vol/tone -- then it stood out very quickly. So, I bet what you describe about OOP applies to the normal in-phase too. I have my original/factory pots and caps. My Special-II is unwired right now (as I overthink everything I'm doing. Drilling holes makes me nervous.). I could wire that back together (using microhook jumpers) and see how this mod sounds with that [original] master vol/tone setup. That's the part I'm not seeing with this "Al King" series. The other serial diagram (in my first post) looks the way you describe. I can see how one pickup flows through the other. But, this "Al King" diagram... I can't see which way the energy is flowing. It looks like it goes both ways. (As mentioned before: I like the AK sound better. The other one, even though I understand it, sounded a bit harsh. I think something is different.). It's not important for me to understand it. It sounds good and that's fine. At this point, I was just wanting to provide a mod option for the original Special-II wiring (if someone didn't want to undertake the dual-concentric mod, but wanted to fool around a little.). Sorry for the delay replying. Last night I was going ask you to explain how to do that "Al King tone" mod with the Special-II's master vol/tone wiring. But, then I thought: there's must be a diagram showing humbuckers in series (with single vol & tone pots). I can see how that's the same thing. (If I added OOP to the generic serial diagram: the neck's green pickup wire would go to the neck's volume pot; the neck's black wire would go to the bridge's black wire.). I still don't understand what that's doing. I don't understand how the energy flows. (Seeing it without OOP causes me to see it differently.). So, I think I'm good. I can merge the AKT and generic diagram into the Special-II diagram. Another question: The Special-II wiring is slightly different (wires go to different pot lugs) compared to the generic serial-humbuckers diagram. Do you think that makes a tone difference? Or, is it essentially the same path? Thanks again! I'll definitely link to this thread in case Special-II owners want to understand their wiring better. I've been reading about drilling risks; gouging, chipping. I'm going to drill a small hole and use a hand-reamer to enlarge it. Ooops. I didn't notice the "reproduction prohibited." Hopefully modifying it isn't the same as spreading a direct copy (when it could be linked to instead). Hopefully that's "fair use." If not, I can make my own based upon it. @EpiLP1985 . I just had a rare moment of electrical insight: If the pickup selector is in the neck position, then the bridge pickup has no other path than to flow (serially) through the neck pickup. When I said this version (AKT) of serial humbuckers sounded better than the other one (diagram in the first post), I listened to it with the pickup selector in the middle. I was thinking that's how it's supposed to work. (The other serial diagram, in the first post, renders the other pickup inoperable. Compared to that, I thought the middle position of this one sounded better. But, now I bet the neck position of this AKT version would sound like that other one. I think the AKT version creates a variable serial in the middle position?). If the AKT's version of serial humbuckers indeed creates a variable serial (middle position), that would add to your observation that the Special-II's single vol/tone will be limited (one dimensional tone, as you said).